The Duke of Edinburgh is to face no further action over his Sandringham car crash. 97-year old Philip voluntarily surrendered his driving licence on Saturday and he has apologised for his part in an accident on the Sandringham estate in Norfolk when his Land Rover Freelander collided with another car carrying a baby last month, leaving two women needing hospital treatment. The Crown Prosecution Service said it has been decided it was not in the public interest to prosecute. All those involved in the collision have been informed and provided with a full explanation in writing. "The CPS has carefully reviewed material submitted by the police in relation to a traffic collision on the A149 on 17 January this year...We took into account all of the circumstances in this case, including the level of culpability, the age of the driver and the surrender of the driving licence." 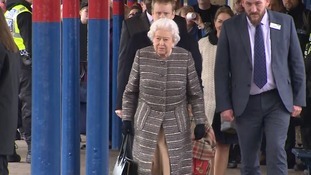 The Queen has joined commuters on the train from King's Lynn back to London after her Christmas break at Sandringham in Norfolk. The speed limit on the Norfolk road where the Duke of Edinburgh crashed will be cut from 60mph to 50mph. The duke saw a doctor as a precaution, Buckingham Palace said. The spokeswoman would not comment on who Philip's passenger was, but it is likely the duke was travelling with his close protection officer. The Duke's vehicle is recovered after the crash.